Italian Prime Minister Matteo Renzi was the driving force behind a joint letter in support of the South Stream project to the European Commission by the leaders of the countries through which the gas pipeline would pass, EURACTIV has learnt. But the effort appears wasted as Bulgaria has now ordered work on the initiative to stop. Renzi proposed that the leaders of Bulgaria, Serbia, Hungary, Greece, Slovenia, Croatia and Austria write to the Commission is support of the Gazprom-backed South Stream pipeline. The future of the project remains far from certain. At the G7 summit, Commission President José Manuel Barroso made it plain that the EU’s executive had launched an infringement procedure against Bulgaria for non-compliance with European rules on energy competition public procurements. Other infringements procedures related to other countries would follow if other irregularities were not removed, he said. The proposed pipeline would arrive in Bulagaria, EU territory, through the Black Sea. Last December, the Commission said that all inter-governmental agreements (IGAs) for the construction of the South Stream pipline, signed between Russia and Bulgaria, Serbia, Hungary, Greece, Slovenia, Croatia and Austria, are in breach of EU law and need to be renegotiated from scratch [read more]. The Commission initially said it would help mediate the amendments of the IGAs and make them compliant with EU law. But in the light of the Ukraine crisis, it indicated mediation on South Stream could only continue if Russia adheres to international law. In the meantime, work on South Stream should be stopped, the Commission said [read more]. The Commission is currently mediating talks between Ukraine and Russia to bring down the gas price negotiated by a previous government, which Kyiv considers excessive. Russia has threatened to cut off Ukraine’s gas, which has potential knock-on effects for the European Union because much of the gas it receives from Russia is pumped via Ukraine. The South Stream project is largely aimed at bypassing Ukraine and ensuring more stable supplies to big EU clients, including Austria and Italy. But EU firms interested in a prospective consortium to run Ukraine’s gas grid, which needs huge investment, don’t look favourably on South Stream, as they see the project as a direct competitor, EURACTIV was told. The rehabilitation of Ukraine’s gas grid can be cost-effective only if Russian gas continues to transit through Ukraine. South Stream, which has a capacity of 63 billion cubic metres per year (bcm/y), would deprive Ukraine of billions of dollars of transit taxes. While Renzi took the lead in spearheading efforts in support of South Stream, the Bulgarian Prime Minister Plamen Oresharski on 8 June ordered the halt of the project, until Brussels lifts its objections. The move came after Oresharski met in Sofia with US Senators John McCain, Ron Johnson and Christopher Murphy. On 6 June the US Ambassador to Bulgaria Marcie Ries said that Bulgarian companies participating in the construction of South Stream could be hit by sanctions. The reason is that Bulgaria has awarded the construction of the Bulgarian stretch of South Stream to a consortium with the participation of Russia’s Stroytransgaz, a company linked to Genady Timchenko, an oligarch under US sanctions. The pricetag of the Bulgarian section of South Stream is €3.5 billion, a sum which according to critics is inflated “Putin-style,” as were the Sochi games constructions. Sabine Berger, spokesperson to Energy Commissioner Günther Oettinger, welcomed the move by the Bulgarian Prime Minister. Serbia, the next country on the route of South Stream, has also indicated its reservations about the project. Serbian energy Minister Zorana Mihajlovi? was quoted as saying on 9 June that her country would delay work on the construction of South Stream, following the Bulgarian decision. But a few hours later Serbian prime minister Aleksandar Vu?i? denied that any decision had been taken, telling a news conference that a decision on a delay could be taken only by the cabinet, which had not met yet. “For Serbia, everything is proceeding as planned,” Vu?i? said. “It is hard to shake off the feeling that the European Commission’s blocking of the start of work on the construction of Bulgaria’s key section of South Stream has been done for purely political purposes,” Russia’s Itar-Tass news agency quoted him as saying. Chizhov also said that the Commission’s pressure should be seen as a lesson by Moldova, Georgia and Ukraine, who aspire to sign Association Agreements with the EU on the occasion of the 26-27 June Spring EU summit. “This is a signal for the countries in pursuit of association status, suggesting they will have a much more limited possibility of defending their own opinion. I hope that this signal will be heard in Kiev, Tbilisi and Chisinau”, the Russian diplomat said. According to diplomats, South Stream will feature high in the 26-27 EU summit, which is expected to discuss measures to reduce the EU’s energy dependence from Russia. South Stream is a Russian project for a natural gas pipeline. As planned, the pipeline would run under the Black Sea to Bulgaria, and continue through Serbia with two branches to Bosnia and Herzegovina and to Croatia. 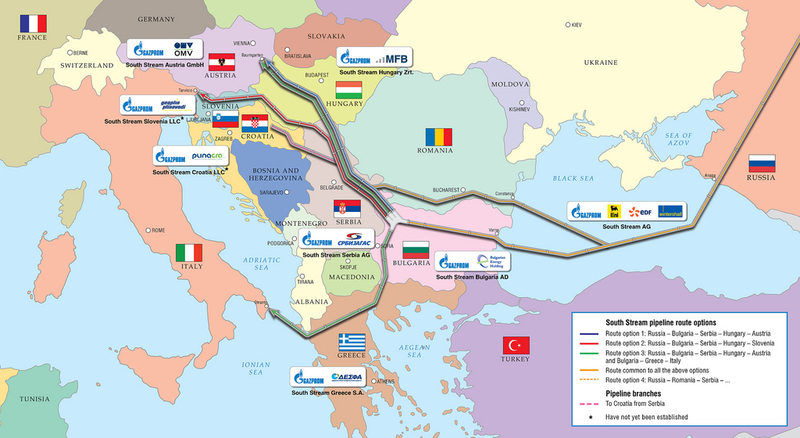 From Serbia the pipelines crosses Hungary and Slovenia before reaching Italy [see map]. Its planned capacity is 63 billion cubic metres per year (bcm/y). 26-27 June: Spring EU summit to discuss measures to reduce the EU’s energy dependence from Russia. Dnevnik, the EURACTIV partner in Bulgaria: ???? ? ????? ????? ?? ?? ?????? ?? "???? ?????" Dnevnik, the EURACTIV partner in Bulgaria: ?????? ?? "???? ????? ": ?? ???????? ????? ????? ?? ??? Dnevnik, the EURACTIV partner in Bulgaria: ?????????????? ?? ????? ? ?? : ??????????? ?? "???? ?????" ? ?????????????? ?? ??? ?, ??????? ? ??????? Dnevnik, the EURACTIV partner in Bulgaria: ????????? ??????? ?????? ???????? ?? ?? ? ??????? ???????? ?? "???? ?????" Dnevnik, the EURACTIV partner in Bulgaria: ???????????? ?? ??? : ????????? ? ?????? ?? ?????????????? ????????? ? ??? Dnevnik, the EURACTIV partner in Bulgaria: ????????? ????????? ??????? "???? ?????" ?? ?????????????? ? ??????? Dnevnik, the EURACTIV partner in Bulgaria: ??? ?? ??????? ???????? ?, ?? "?????????????" ?? ????? "???? ?????" ? ??????? ?